Are You Still Standing at the Edge of the Diving Board? Or are you going to jump? Eloheim talked more about limitation in this session, saying it gets you to stand at the end of the diving board without actually diving off, and as a community, we’re quitting that. We are no longer letting limitation dictate your experience, said Eloheim. You have more options, look for a third way. You are breaking out of a small life, something you have been asking us for for years. You are chipping away at habits and limitations, busting out of all the different ways you’ve been told that a small life is all you’ve got. Habits justify staying the same. Staying the same, staying small means stalling evolution. In small decisions, there’s a choice for not changing. Arguing for limitation is the new version of “I Statements,” neither feels good anymore. Those justifications may be so ingrained, you might not know you’re doing it. The tool, “I don’t know” is utterly important at this time. Use it when you catch those limitations. Let yourself off the hook. Say, I don’t know before making a decision or choosing a thought. The survival instinct uses a con game to limit you, to give you a small life, to avoid uncertainty, to find comfort in certainty. When you catch yourself arguing for limitation, do something different, mess with it a bit, say yes to something else, change something. Eloheim called on each group member to share their own experience with limitation. Each person had a unique example where they noticed a limitation and Eloheim then offered some insight about them. 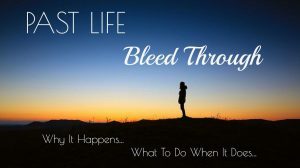 Relationships, financial planning, checking that automatic or habitual “no”, a perceived sackful of limitations, and preconceived notions about people were some of the limitations discussed. 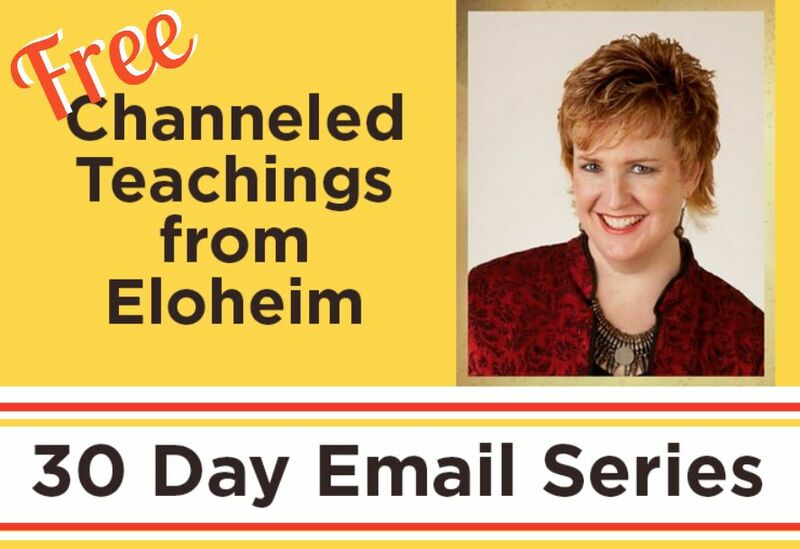 You’re moving toward Homo spiritus at a rapid pace, said Eloheim, and there’s a little bit of an anchor off the back of your boat that catches on something once in a while. It’s slowing you down a bit but you can speed it up. Be conscious of your limitations and when they pop up to slow you down. Imagine a pond with raindrops on it, said Eloheim. 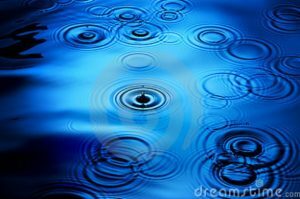 The drops hit the water and ripples spread outward. 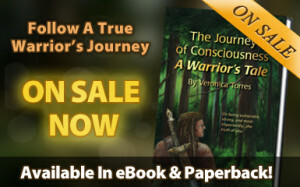 Veronica always pictured that as how her emanation works. We want to make it more detailed. It’s actually more accurate to visualize your emanation as being comprised of lots of little circles that ripple out. Instead of your emanation being one big ripple, every thought that goes out has its own ripple . 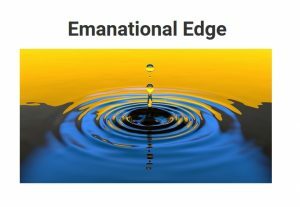 You have to be aware of your emanational edge. Your emanational edge arrives on the scene ahead of your gingerbread shape. So what is your edge? Your survival instinct stuff? Each thought has it’s own emanational edge, colored by where that thought began. That’s what your emanating. So, what are you offering? Each drop, each thought that hits the pond moves out and encounters the next now. You are a conglomeration of emanation constantly. Each thought can be “experience and explore” rather than survival instinct. You know how to do it. 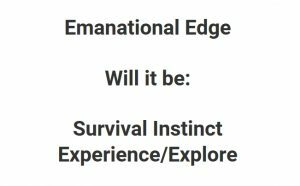 “I’m tempted to” changes survival instinct to “experience and explore”. You don’t jump off the edge of the diving board into Level 7 if you are in survival instinct. We haven’t talked about your emanation being granular like this. It’s a way you’re creating your reality. It’s the way you’re encountering your soul. It’s the way you’re instructing the protons and the connections you’re making as to who you are and what you are fascinated by. Your emanational edges have been coated by worry, fear confusion, survival instinct, and authority figures. 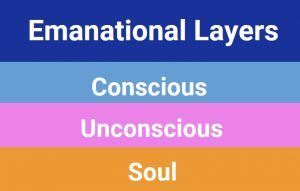 Emanational layers. New term. Your emanation is coated with something: Conscious, Unconscious, and Soul layers. 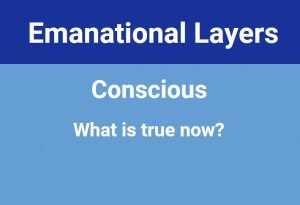 One is the layer you are conscious of, the “what is true now,” the Conscious layer. 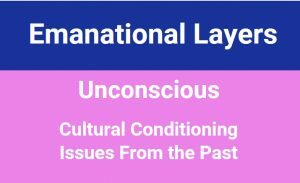 What about your Unconscious layer? What about the things you are unaware of, like cultural conditioning, prejudice, religion, gender bias, body language, issues from the past? The work we have done pushes a lot of things into the conscious layer. 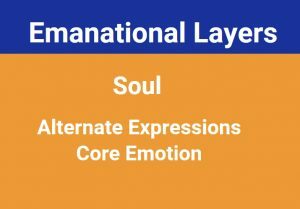 Then there’s the Soul layer: the things your soul desires to explore with you like alternate expressions and your core emotion. Why is this important? Your emanation is part of every thought you have. Your emanation is how you’re greeting your reunification of your soul. Every thought you have generates an emanation and that emanation tells the world who you are, what you value, and what you seek. Energetically it’s being projected through your emanation to the world. It connects with everything. Your emanation gets there first. “It’s all me” means you don’t end at your skin, that you are more than your gingerbread shape, and your emanation is the part of you getting to the next thing before your physical self. 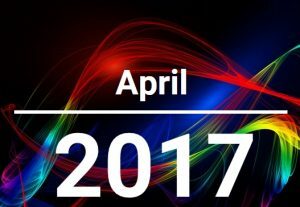 What are you putting into your emanation? If you could see your emanation, our job would be so much easier. Most of you can’t, so we have to talk about this in other terms. Check yourself, what are my ripples touching and what are they made of? These graphics were displayed during the meeting. Saying that the previous talks about limitation and emanation need some integration time, Eloheim chose, instead, to continue to upgrade and reinvigorate more of the tools. There was also a great discussion and exploration of how your core emotion interacts with all this, how it is affected by the balancing of the BPA. Guardians: We feel you are at a new doorway. You have been invited to walk through. There is a welcoming happening, “Hello, you’re here!” Here is not a static place. It’s this now and this now and this now. You’re being met by more of you you haven’t met yet with the current version of you. This requires consistency. It is not anything hard. Each now is a sacred opportunity. Visionaries: Opportunity is the word. We are off the map, way off the map. The “shout-y” people are really loud on the media outlets but there’s more of the “good” things happening with the people who are quiet. It’s easy to be distracted by the shout-y people. Where are you putting your focus? Eloheim: We want to clarify the difference between Level 6 and Level 8. You have been doing Level 8 and don’t know it. The physical world takes a little longer to get it. We had to find a doorway to Level 7/8/9 through the BPA to make it more real for you. The group shared several examples of their own recent experiences with Level 8. More of you are in Level 8 more often than you know. The Level 7 checkbox is the balance of BPA. Level 8 takes the BPA into the marketplace. Fred: So much going on! We’ve been working with Veronica now that she’s merging more with Eloheim. She talks to us instead of E. We’ve been doing a serious inquiry into Level 9, exploring the mechanics of Level 9 by having her explore essential oils. We want to let her sensitivities off the leash and the opportunity to do this by working with the oils is big. We want to position her energetically to lead the community into Level 9. You have no idea what Level 9 is like. Level 9 is a very energetic, emanational experience. Warrior: Remember, everybody does Level 7 differently. You have an idea how you do it or you need to ask E to help you figure it out. Offering the visual of a herd of animals moving in the wild or a flock of birds in the sky, the Warrior said protons move in much the same way. Starlings moving in the sky are doing their thing. They are individual and collective simultaneously. Protons are responding to the individual and collective drive in a similar manner. Allow this to be a seed that germinates. No pressure, we are watering the seed that E planted. Matriarch: What can we add? Keep doing what you’re doing. It’s working. Want each now. Want what each now has to offer.